May is National Bike Month! Decatur Celebrates with a Variety of Bicycling Opportunities! Every Saturday: Sam’s Freight Room Ride, 2pm, Meet at 415 E Howard Avenue for an easy 11 mile ride through Avondale Estates, Oakhurst and Decatur. No drop ride. May 10, 17, 24, 31: Silver Spokes Program – Ride with Trikes. See a preview May 18 at the Senior Picnic at Glenlake Park. May 15: Ride to Stone Mountain Park, 9 a.m. Easy no-drop ride. Meet at Bicycle South, 2098 N Decatur Road. Refreshments at Bicycle South after the ride. 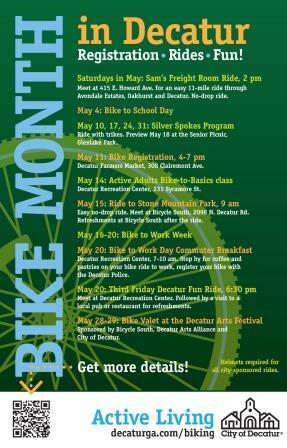 May 20: Bike to Work Day Commuter Breakfast: Riders are invited to stop by Decatur Recreation Center between 7 and 10 a.m. for coffee and pastries on their way to work. May 20: Third Friday Decatur Fun Ride, 6:30 p.m. Meet at Decatur Recreation Center. Followed by a visit to a local pub or restaurant for refreshments. May 28 -29: Bike Valet parking is offered at the Decatur Arts Festival. Sponsored by Bicycle South, the Decatur Arts Alliance and the City of Decatur. May 28: Bike Registration at the Decatur Arts Festival at the Bike Valet, 10 a.m. – 1 p.m. Bring your bike to have it registered by the Decatur Police. Pick up some Bike Safety information. Helmets are required for all City sponsored rides. and www.decaturbikes.com/articles/rides-and-events-pg37.htm for more rides in Decatur.